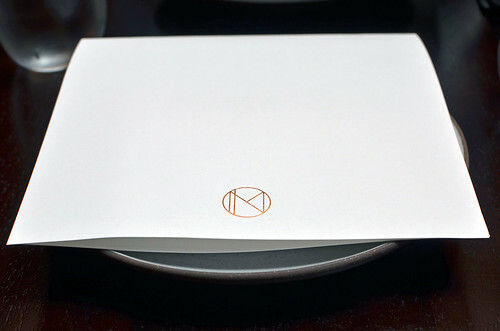 We had our best meal during this New York City weekend at The NoMad, the "casually elegant" restaurant of Chef Daniel Humm and Restauranteur Will Guidara, whom I met last November and who run the Michelin three-starred Eleven Madison Park, where we celebrated our fourth wedding anniversary two years ago. 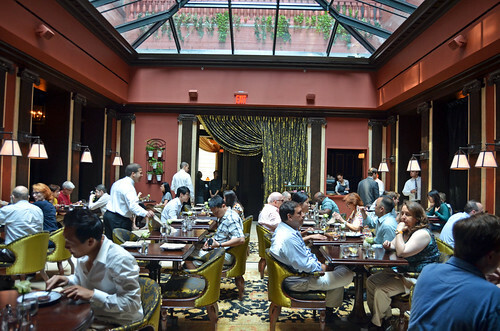 Was there any question that this would be a wonderful dining experience? Of course not. The NoMad met our very high expectations and then some. 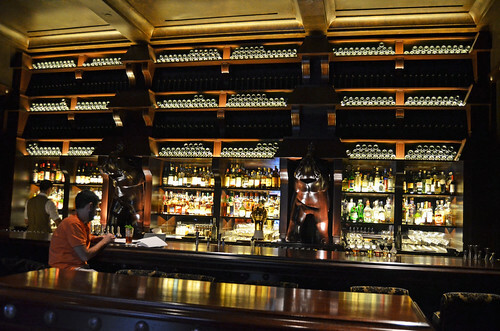 We were extremely impressed by the food, service, and welcoming but sophisticated setting. This hot delicious bread was otherworldly. And it was free. And limitless. 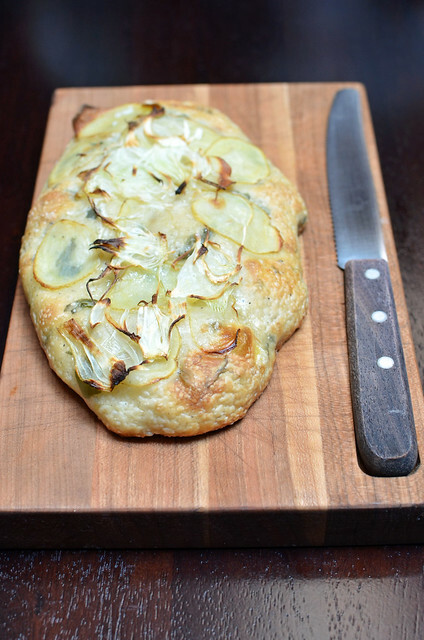 You could come here and drink and just eat this focaccia and die happy. Seriously. 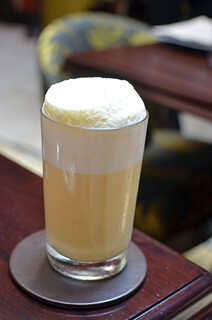 Orange Julius -- orange juice, cream, orange blossom water. 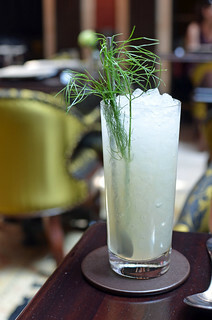 Basil Fennel Soda -- basil, fennel, lemon, sparkling mineral water. 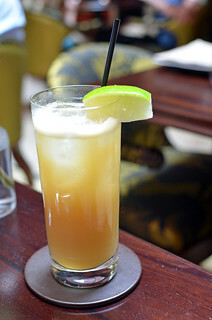 Gingered Ale -- ginger, lime, demerara sugar, sparkling mineral water. La Piña -- pineapple, jalapeño-infused agave, lime. 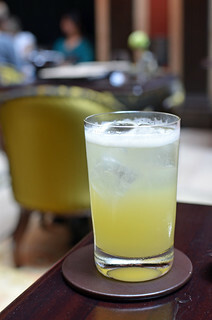 The drinks at The NoMad are incredible, and we didn't even get "real" drinks. These "soft cocktails" ($8 each) blew us away. The flavors were so bold. I can't even imagine how fabulous true cocktails would be. 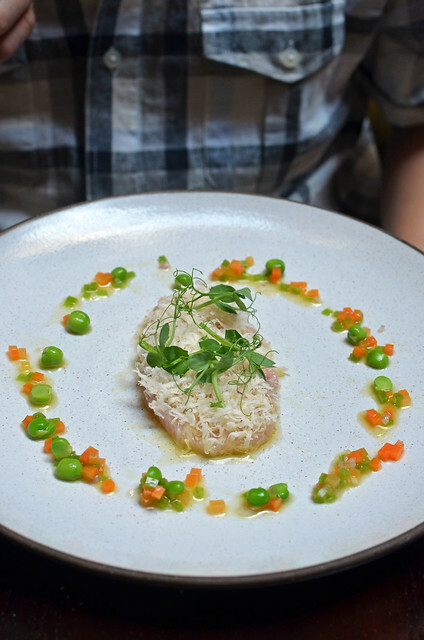 Hamachi -- crudo with English peas, olio verde, and horseradish ($16). Refreshing and light and delicate yet impeccably pungent. 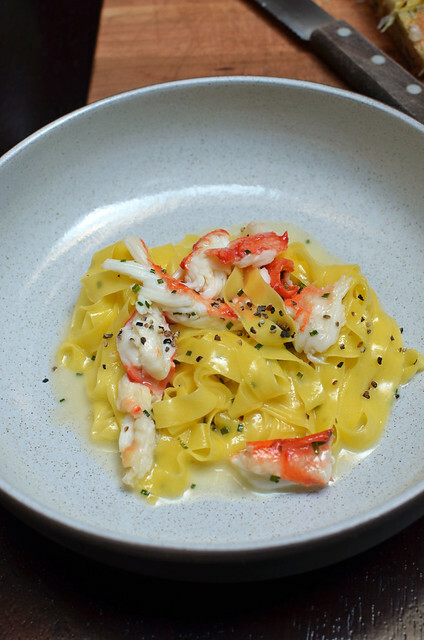 Tagliatelle -- King crab, Meyer lemon, and black pepper ($19). Generous portions of crab surrounded by exquisite lemony pasta. Love. Duck -- roasted with apples, dandelion, and Vadouvan ($32). 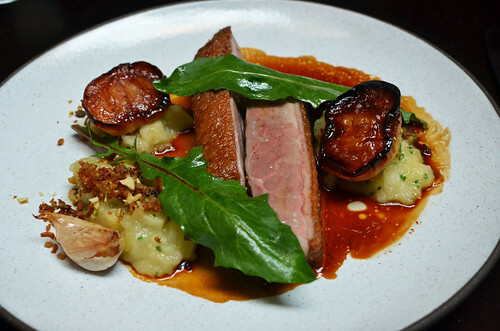 This was the best duck breast we'd ever had in our lives to date. Not sure I need to say anything more. 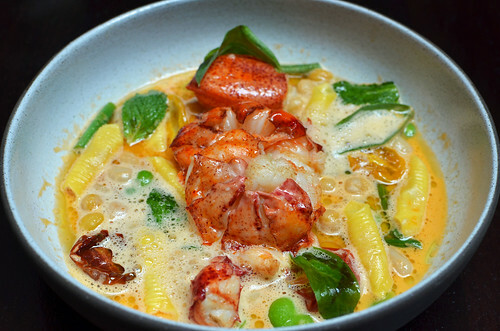 Lobster -- minestrone with fava beans, lemon verbena, and garganelli ($36). Heavenly. We savored every last drop. Sopped the bowl completely dry with focaccia. Truth. I spotted this extraordinary cart from across the room. 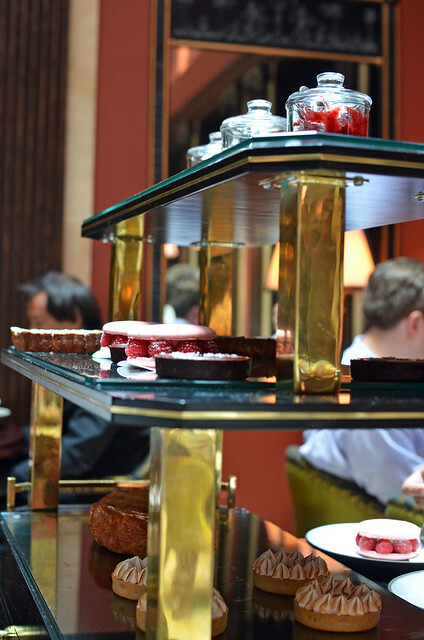 Tiers of sweet delights awaited us. 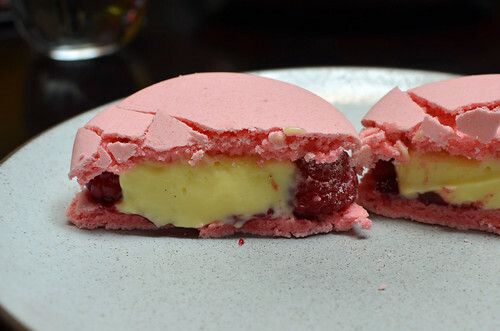 Giant raspberry custard macaron ($9). Fresh fruit and creamy custard wedged between fragile, fragrant, airy cookies? Win. Wow. WOW. WOW. 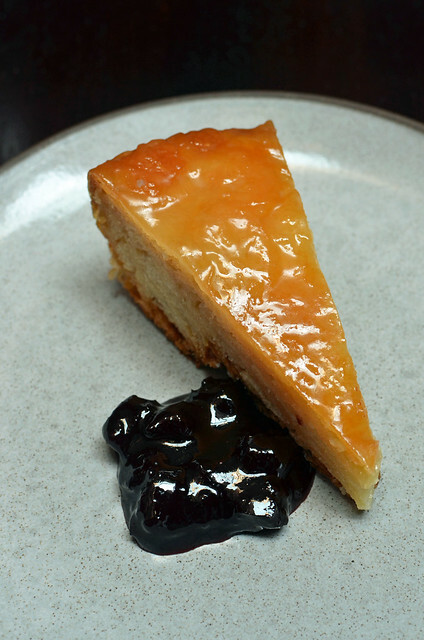 Imagine layers and layers of the most ambrosial, buttery, sugary, puff-pastry-like sheets baked with a caramelized top. Are you drooling? You should be. I am. I'd never had anything like this before. I am a happier person now. This card says it all. 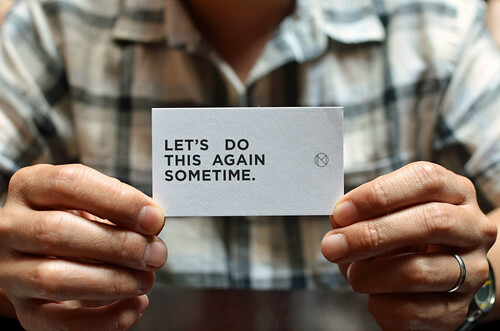 Yes, let's. Let's experience pure perfection again. Want to eat it alllllll! This looks ridic! I love orange juliuses - is it julii? whatever. and the pasta is glowing. best duck breast, lemme at it. i'm going. one day. soon. the cart is mine. It really was ridiculously grand. I, too, love Orange Julii. OMG, that king crab-meyer lemon pasta. i want it. It was fit for a king. This meal looks so impressive, even more so than usual, which is kind of saying a lot. My favorite looking dish is the lobster minestrone. Holey cow. And Mr. Monkey wore shorts. LOL. i want to try a fancy orange julius! I love the photo of the focaccia. It’s just bread, but it looks fantastic! 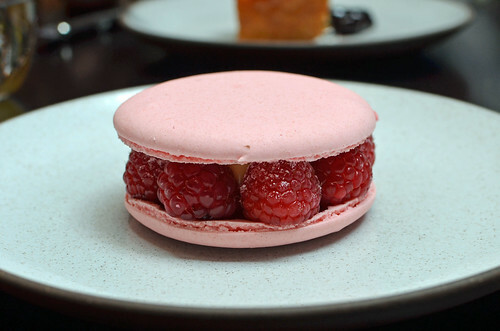 I’m also dying over the dessert pics, especially that custard macaron. Ugh, and that lobster? I die.